Congratulations to the winner of the Unlimited Romance Pinterest Contest – Eva Thompson! She will enjoy a 3-night Unlimited-Luxury® stay at a select resort. 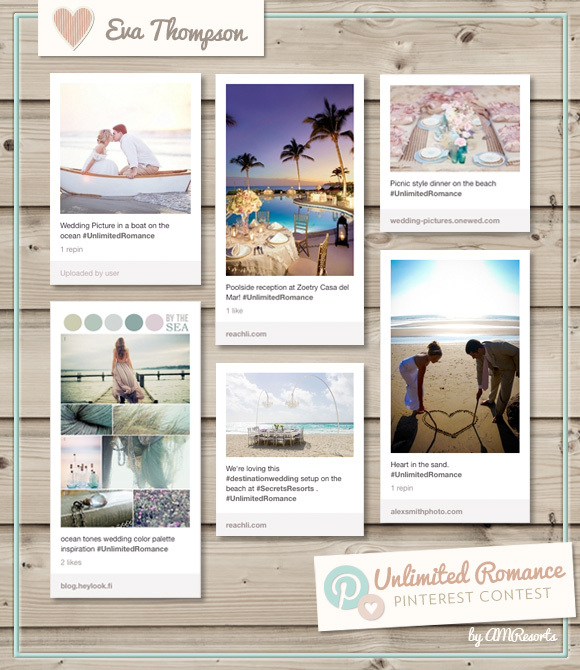 Below is a preview of her winning Unlimited Romance board. To view Eva’s complete board, click here. Thanks to everyone who participated. The submissions that came in were very creative and will definitely inspire romance! Continue to be inspired by real weddings that take place at our beachfront resorts on www.UnlimitedRomance.com. Stay tuned this spring we will be launching another wedding promotion on the site. This entry was posted in Now Resorts & Spas and tagged destination weddings, Unlimited Romance, weddings. Bookmark the permalink. ← Now Resorts & Spas have the cure for Spring Fever!